Welcome to the world of learning and practicing music! To start, take a look of our annual program of projects and activities, as well as pictures of previous student’s concerts! To connect with me, you can write me at candidaborges.education@gmail.com. My facebook is http://www.facebook.com/candidaborges. My cellphone numbers are 718 200 1926 and 347 408 1220 (landline – no text messages). For sure, my email, facebook messenger and my whatsapp (718 200 1926) always work! If you want to record the classes, feel free to use your cellphone to record it in audio or video, as you prefer! We can rearrange lessons freely when it is in advance of 24h or more, and it will happen in the current week or the upcoming one, according to availabilities. To cancel ongoing lessons, please inform minimum 2 weeks in advance. Within 24h, the class will be charged to the student. Classes can happen in 30, 45 minutes or more. In home, minimum 45 minutes. When your package of lessons finishes, make sure to sign for the automatic payment, or keep an eye for an email asking for the renewal of your package. And to get to know the content of your course, check the syllabus HERE. 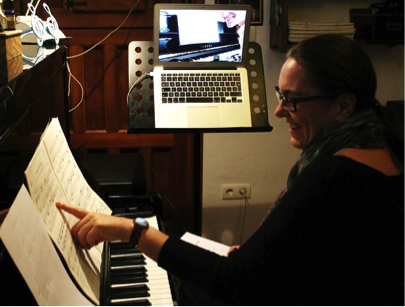 Online lessons are a very practical way to save time going to the studio and very convenient when it’s winter!!!! Also, It allows us to connect even when any of us is travelling, or living in any place in the world! It’s also a more economic fee. I recommend you to use 2 different devices in the class, but just 1 works fine also. A laptop and an ipad*, or a smartphone. No extra camera or microphone is needed! 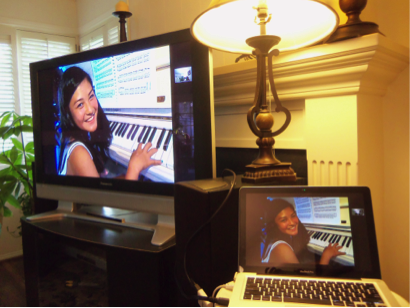 One device will run your Skype and webcam – that would be your laptop. Even a very old model of computer can run Skype easily! 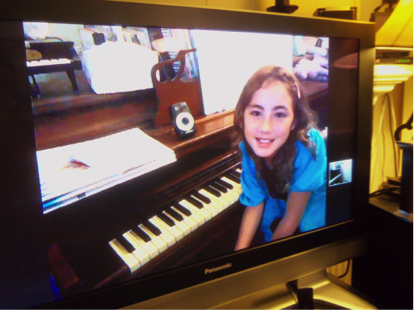 You can also use Takelessons classroom, or Zoom, or FaceTime, or Google Hangouts – any software more convenient to you. Just make sure you log in before the class, and I will call you when it is our time. Skype is the prefer ram software for sound/video. We also need to access the google drivelink that you will receive in the first class (to watch my written instructions) and youtube vídeos. So, if we can use your computer and ipad/smartphone at the same time, would be awesome! If not, just your computer is totally fine for the class! Skype is the software that better works for classes! Please install it in your device and create your account (if you still don’t have it). Remembering: it’s for free! Also remember to check for updates in your Skype and make a test to see if your camera and microphone is working good. You can call “Skype test call” in your list of contacts to check everything is good and in good level! Second step, add me as your contact. Search for “candidaborges” and you will find me easily! If you can’t find me, just send me by email your skype name and I’ll find you. Another good software to install is the youtube. We will need some videos! The device where Skype is needs to be positioned in a way that I can see you well. 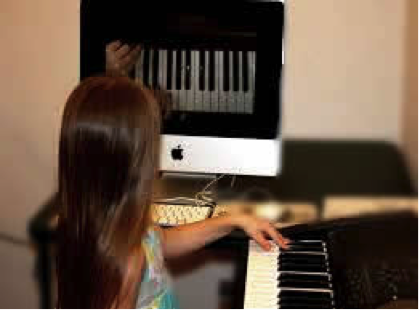 If it’s a piano lesson, on the side of the piano is perfect for me to see your position and hands ( I recommend using a music stand as a table, or a real table on the side). If it’s a singing lesson, I prefer to see your up body from the front. Please remember to share with me the scores/ sheet music you are using! If it’s printed, please take a picture and send it to my email candidaborges.education@gmail.com. If it’s in pdf, just forward it to me! This way we can read the same material together! It’s very important to be in a silent and illuminated place for your lessons. If you are in your living room and you have kids or pets, maybe you want to use a headphone to hear me well. Also, a VERY IMPORTANT thing is that you need a good Internet signal. Check if it’s the best place in your house for your wifi signal (or if you can connect an Ethernet cable to your computer from your router). So, make sure you have your Skype ready to go and your googledrive file open (you will receive your link in our first class), Ipad or phone charged, printed sheet music, everything! If you have any doubt, just let me know and we set everything easily for you.